Saturday night's crowd was far from the largest of the year at Charlotte County Motorsports Park, but those who did come out to enjoy a beautiful December evening had a special treat. They got a chance to see the famous jet-powered dragster -- The Green Mamba -- do its thing at the Punta Gorda 3/8-mile paved oval. As a warm up, driver Doug Rose took the Mamba a few times around the track after the heat races. 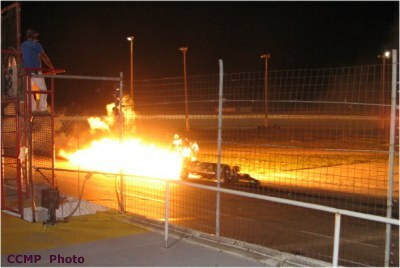 The crowd was wowed every time he turned on the afterburners, shooting flames some 20 yards. Then, following the features, came the grand finale -- the Mamba actually melted a Chevrolet Jimmy with its intense burners, literally blowing the vehicle away. There were six divisons of races at CCMP. Dan Benoit had a super finish in Road Warriors, sneaking to the front with two laps left after sitting back in fourth for most of the race. Ricky Shelnut led the most laps with Cory Scott giving pressure. Benoit was able to make up ground on a caution on lap 22. Then, following another caution a lap later, Benoit was able to muscle his 20 car past Shelnut's 9 car. Anthony Easton finished third. In Fastrucks, Patrick Fox of Alva grabbed his first career victory, as he kept his 4 truck comfortably ahead of the 3 of Terry Price. Price was testing out a bum knee. After the race, it was a thumbs up. Thirteen-year-old Zack Donitti was third. In Thunder Trucks, Ray Jayne held off Ryan "The Hammer" Pancoast in a heated battle. The bad news for Jayne was that he was disqualified after the race. Pancoast, who raced Jayne hard on the outside groove, ended up the winner. Pancoast was driving the No. 21 truck for Randy Kile, who was out of town at brother Spud's funeral. Spud was a former racer. Pancoast even had Spud's No. 14 painted on Kile's truck as a tribute. Richard Dupont moved up to finish second. In Pro 4s, Danny Daniels kept his 09 car ahead of the 8 of Kirk Risner. Shane Moore was third in the 24 car. In the Fab 4s, Rose Macho passed Lance Sober on lap 6 and was able to take the checkered. Mark Davis moved up for second. Sober was able to take third. The hardest wreck of the night came in Modified Minis, as Corbin Gibbs hit the frontstretch wall early in the race. He was OK.
Chris Zimmerman, a 15-year-old from Bradenton, sped away for the win. Matt Watts took second and Phil Cruse was third.